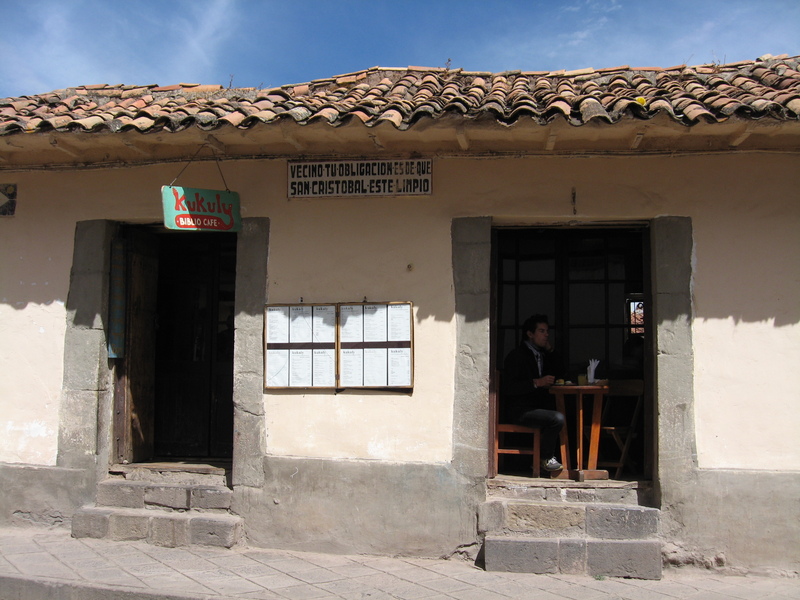 We took the Palomino bus from Abancay to Cusco (5 hours, 15PEN/CAD$5). There happened to be a Palomino bus station directly opposite our hostel, so at 5:30 in the morning we decided to catch our 6:00am bus there (thinking it must go to the main terminal). The bus didn’t do that. We weren’t idiots. We had asked the driver, he checked our tickets (twice) and confirmed that we were on the right bus heading to Cusco. The bus didn’t stop at the main bus terminal (where we were supposed to get on). So we sat on the bus for 5 hours hoping that there would be enough seats for everyone. There was and we made it to Cusco. View of the main square, Cuzco, Peru. Cusco is a world apart from what we have seen so far in Peru. It’s a tourist haven (and Pog capital of the world) and we spent most of the day walking around the city and the market. 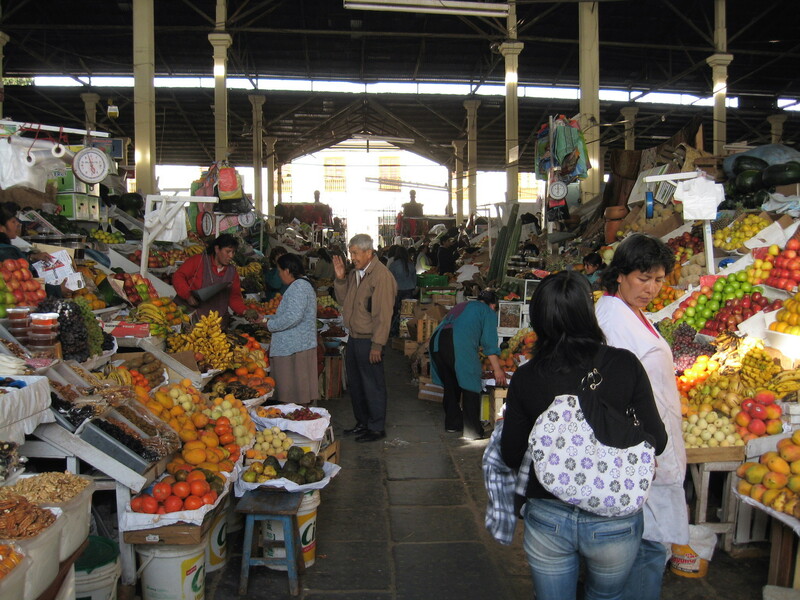 Cusco is quite touristy… walking around the main square is a bit like running the gauntlet with all the tourist touts. No, I don’t want a massage, a pedicure, or a hat made in China that says “Cusco” on it. Cusco is undeniably beautiful though and there are many spots that are perfect to sit and watch the red rooftops bake in the sun. The town is nestled in a group of mountains which makes it even more ridiculously perfect. We stayed in Hostal El Tuco on Avenida Grau, 835; just less than a ten minute walk from the main square. It was conveniently located next to a grocery store and the buses to Pisaq (our next destination on the road to Machu Picchu). The owners of El Tuco made sure to let us know that we should feel at home in the large colonial style house, and we definitely did feel that way. The hostel was very clean with access to a kitchen, breakfast in the morning, and internet. They allowed us to store our luggage while we ventured into the Sacred Valley and on to Machu Picchu. Kukuly Biblio Cafe where we had the best lunch ever. At lunch time we found an amazing little cafe called Kukuly Biblio Cafe where we had a delicious meal of quinoa soup, aji de gallina, dessert and some freshly squeezed juice; all for 6PEN/CAD$2. Our plan is to take the back (read: cheap) route to Machu Picchu through the Sacred Valley. Our next stop is Pisac. We will take Empresa de Transportes Interprovincial Pitusiray (at Av Tullumayo & Calle Inticahuarina) for 2.40PEN/CAD$0.83. To get a better sense of our adventure in Cusco, watch the Cusco video in our backpacking South America series of videos. do you think it’s very expencive to fly the from Israel?